The weekend of 22nd-24th April saw over 130 students flock to the Weymouth and Portland National Sailing Academy for an intense weekend of competition. It was all to play for – as results counted for both the students overall rankings across the SWA series, as well as BUCS points up for grabs for their universities. We’ll look at what happened in both competitions – kicking it off with the BUCS competition. With the potential to earn BUCS points for their universities, 41 competitors took to the water on Saturday morning for the advanced racing. There were 5 races, with one discard, with the course building in difficulty to a figure of 8 slalom course as the races progressed. Competitors in the advanced division were allowed a maximum 7.5m2 sail, and many chose to team this with longboards to take advantage of the 15 knot conditions. Coming out on top of the fleet was Rob York of Bournemouth, who was joined on the podium by Matt Barton (Exeter) and Nathaniel Warren (Southampton). First female was Saskia Sills of Bournemouth, who managed to finish 4th overall. With 23 competitors taking the start line, the intermediate competition was going to be close. With consistency over several races key to success, it was a tough race. Coming out on top was Benjamin Wall of UWE who managed to hold off the competitors from rival club Bristol – Juliet Cairney bagging 2nd with Pablo Tarodo in 3rd. Sunday saw the ultimate competition – the team racing event, run on the one-design kit of RRD FireRace 120L freerace boards and Tushingham Concept 7.5m2 sails. There were 17 teams entered from 13 universities, so teams were split into 3 heats, with just the top two advancing to the final. With the wind constantly shifting, it was a battle upwind to the buoy. In the end the top 6 teams, advancing to the final were Cardiff, Swansea, Durham, Birmingham, and two teams from Bristol. With everyone watching on, Bristol 2 and Birmingham got off to a rough start, meaning it was four teams battling for the podium. Some excellent gybing from the Bristol competitors made the difference, and they bagged the top place with Cardiff not far behind. It was a separate fight for 3rd, with Swansea and Durham going back and forth as each team changed over competitor. Swansea just pipped them on the line to take the final podium position. Thank you to everyone who helped out making the event a success, including Colwyn Bay Watersports, Boardwise and Weymouth and Portland OTC. A massive congratulations to everyone who competed, and particularly those taking home BUCS points to their universities. Check back for the next article, when we’ll look at who came out on top of the overall SWA series – the ultimate test of windsurfing across the year! Spring is coming, temperatures are rising to dizzying levels and the stage is set for the world famous climax to the SWA year: BUCS National Championships 2016; The Great Migration! Vast movements of ocean and air currents bring dramatic change throughout the year and in a few special places, these seasonal changes create some of the greatest wildlife spectacles on earth. One of the most awe inspiring events, takes place in the great open plains of Portland. Once a year 300 student windsurfers gather in the small corner of south England, this is the greatest concentration of wild windsurfers on the planet. But the herds only stay for one weekend before continuing on their epic journey. The northern edge of the island, is dominated by mount WPNSA, known to the indigenous people as the land of lashtionals. It's one of the many landmarks, that has shaped the windsurf landscape here for centuries. Prides of Lions, a bind of salmon and a sloth of bears, a spectacle of sorts is set for the annual congregation of the SWA BUCS Nationals: The Great Migration. Student windsurfers from herds across the lands will group, to hunt their prey, in the avid search for BUCS Medals. There will of course be a fancy dress party of which only the fittest will survive. The venue is set in the shadow of the wondrous mount Portland at the Weymouth and Portland National Sailing Academy. The date is 22nd-24th April, come and join the SWA for this celebration of everything great about windsurfing! Bring your tents/vans/yurts/mud huts to occupy a small territory in the wild SWA short grass plains at Northdown Farm, Osmington, Weymouth, Dorset DT3 6ED. Once your accommodation is constructed then head to the Friday night watering hole; where the stocks may dry off, making hunting what few animals remain even more difficult. The pride must keep moving to find food, but gradually the stumbling cubs weaken. Beware, younger, freshers cubs may fall into poor condition, and may not keep up with the adults, and their fate seemingly sealed. However, when the pride is relocated the following morning, the cubs will have somehow survived and been reunited with the adults. The herd will face a further challenge as the active volcano mountwindsurferous erupts for the first time since 2015, raining crests down on the plains. Saturday and Sunday will see competition for the strongest of the groups. Dig out your fancy dress, polish your raceboards and we’ll see you there! **Actual serious & important information to be circulated in Presidents Pack! With the end of the world at risk last weekend, 150 students headed to Nottingham to take it on together – would they survive to windsurf another day or was it really the end? Somewhat worse for wear on Saturday morning, but fuelled by bacon and eggs, the windsurfers arrived at Notts County Sailing Club. The day’s action kicked off with the advanced racing, and the borderline wind conditions meant that pumping action was crucial in many of the heats. With over 20 competitors, it was a tight field. Showing some great gybing and pumping it was Liath Campbell (Durham) who was victorious over Mikey Jarman (Swansea) and Matt Duffin (Bristol). After refuelling and re-warming in the club house, the competitors headed back out for the team racing. Defending champions Cardiff were unable to get a full team together for the final, leaving the field wide open. Swift changeovers were the key to Durham’s success, as they managed a clear victory, with Southampton and Swansea fighting a close battle for 2nd and 3rd respectively. These results have certainly shaken up the overall podium standings, meaning it will all be to sail for at BUCS Nationals in April. The conditions were ideal for the intermediate racing, which lived up to it’s reputation of chaos at the gybe boy. Coming off the back of her success at BrUWE, Izzy Mitchell (Bristol) was once again victorious, followed by Ronan Smith (Imperial) and Niko Bugelli (Liverpool). Those who didn’t fancy the chilly water kept warm with a spot of sumo wrestling – which for some still resulted in them taking the plunge! Back in Nottingham, students indulged on Domino’s pizza and put the finishing touches on their ‘End of the World’ costumes – with everything from Angels and Zombies to Mad Max making an appearance as they partied into the early hours. Sunday morning and the combination of RedBull and some unexpected wind worked wonders in blowing away the hangovers from the previous night. The tandem windsurf, kindly provided by Notts County Sailing Club, was a favourite of many, whilst others opted for the vast collections of kit kindly provided by Boardwise and XPLG. Meanwhile, the beginners showed their racing prowess – Giovanna Siadaoui (Southampton) took victory over Kieran Picford (Nottingham) and Robyn Murdoch (Swansea). Many thanks to the Nottingham Committee for organising the event, Boardwise and XPLG for providing lots of kit, RedBull for the music and drinks, and Notts County Sailing Club for hosting the event. All photos thanks to Notts County Sailing Club. The final event of the Core Series certainly was a great one. Next stop – Cardiff Wave for some, then BUCS National in April – where students will go all out in pursuit of both BUCS points and the coveted SWA titles! The SWA Wave Series came to a close this past weekend in Cardiff. Despite the anticipation, mother nature had other ideas and wind failed to materialise. SWA: Congratulations on your new SWA Wave Series title Matt, was there a particular moment that stood out this season for you? MC: I would say the highlight was competing in the Plymouth comp in amazing conditions, full on down the line logo high waves, stacked on 3.7. SWA: What do you think was the secret to your success? MC: I think the secret to my success was probably just sailing down in Cornwall for the last three years and sailing whenever I can get out. SWA: Do you have any idea what ION goodies you would like to spend your prize money on? MC: I'm not really sure what I will spend the voucher on, possibly get myself a new wetsuit and maybe some new gloves for surfing in the winter. 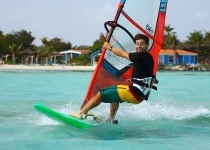 SWA: We understand you are graduating this year, what’s next for you with regards to windsurfing? Equal on points are Tom Bennett Lloyd and Sara Kellett. A second place finish in the final counting event puts Tom into second overall with Sara taking third. Tom and Sara also win ION vouchers with which to pimp their wetsuit or accessory collections. A final prize of a Vandal Riot wave sail on loan for a year will be awarded to a standout unsupported rider at SWA Nationals in Weymouth. Even without the wind the show must go on with the SWA - Cardiff Uni Windsurf Club organised a great selection of day and night time activities to entertain their eager guests. This was kicked off on Friday night with a catch up in the pub before a boogie at Glam night club. After a chilled morning, of bacon and post night out debriefs, tour sponsor Puravida organised surfboard hire and a beginner session to take advantage of the beautiful swell rolling into South Wales.Rest bay at Porthcawl played host to a fleet of around thirty SWA surfers shredding the glassy waves at low tide. Some of the more experienced surfers were rewarded with some building waves as the tide pushed in while others returned to Cardiff to watch the big England vs Wales rugby match and ready their fancy dress for the Disney/Pixar themed punch party. Sunday was a lazy day for many hungover students with some opting for another go at surfing while others went to Barry Island for a good old day at the seaside with fish and chips and the penny slots. No wind all weekend, but beautiful blue sky and the first of the spring sun meant that Cardiff wave ended with smiles all round. That’s it for the SWA Wave Series this year, see you all at the final SWA event of the year at Nationals in Weymouth on 22-24th April. Details to follow for that, keep your eyes peeled. The SWA Wave Series will return in the autumn with the start of a new university year and the first of the winter storms. Huge thanks to our tour sponsors; Puravida Boardriders, ION accessories, Vandal Sails, Funsport and RB sails. Here’s the lowdown on the latest stop of the Student Windsurf Association Core Series – BrUWE Wet Dreams 7 – hosted by Bristol and UWE Universities. Kicking off the new year of student windsurfing, 150 students were undeterred by the chilly February temperatures and arrived on Friday for the traditional night of catch up, eagerly anticipating the weekend’s activities. Early on the Saturday morning the students headed to Bowmoor Lake, not so well rested but fuelled by bacon and eggs, and ready for a full day of activities. RedBull were around to provide some much needed energy as well as music to set the scene. Swanky demo kit was kindly provided by both Boardwise and Patrik Dielthelm UK for the students to play with at their leisure. By lunchtime, the wind was still not quite living up to what many hoped for, but the decision to run the Team racing regardless was made. This saw the first outing for the brand new Tushingham Concept race sails, thanks to a generous grant from Sport England. With fourteen teams entering the heats, it was bound to be a close competition. Eventually the top four teams making it to the final were the top 3 teams from the previous event - Up The Brum – and Southampton. Cardiff pulled off some quality changeovers and three solid legs to maintain their position at the top of the podium, followed by Bristol, and Southampton. Those who didn’t fancy the water instead turned their attention to the giant inflatable obstacle course! The Saturday night saw students indulge in a night out in Bristol, kitted out in their best (somewhat sparse) costumes fitting the theme ‘Wildest Fantasies’. Memories were made and rapidly lost as the students showed what they could do in the club as well as on the water. Somewhat bleary eyed, they returned to Bowmoor on Sunday for a big day of windsurfing. Kicking off the action was the advanced racing, where Amy Robinson from Cardiff sailed both a fantastic heat and final to take the top spot, leaving the boys behind. James Arney from Bristol and Alex Parker from Cardiff rounded out the podium. The intermediate racing was a particularly spectacle, with the light wind resulting in a pack that ultimately collided, much to the crowd’s amusement. The final even delivered some planing conditions that Pablo Andrew-Andalaft Tarodo from Bristol was able to take advantage of, heading past fellow Bristol competitor Izzy Mitchell and Georgie Stewart of Swansea. The beginners also showed how much they’ve progressed already this season, with Ed Sweet-Escott (Bristol) taking the win, ahead of Josh Wilkins (Swansea) and Luke Jones (Liverpool). With no chance of high wind, competitors in the freestyle competition showcased their best lightwind moves – everything from upwind 360s to headstands! In the end Alex Parker of Cardiff took victory over Thomas Francis (Cardiff) and Adam Ouzeri (Imperial). A BrUWE event wouldn’t be complete without jelly wrestling and the obligatory battle between the Bristol and UWE presidents. The mess quickly escalated with many windsurfers fancying their chances in the ring! Massive thanks to Bowmoor Sailing Club for hosting the event, the sponsors Boardwise and Patrik Sailoft for providing kit, as well as Colwyn Bay for providing safety cover. Finally, thanks to the committees of Bristol and UWE for organising the weekend. The next stop on the core series is Nottingham Pondlife XII on the 26th-28th February – visit www.studentwindsurfing.co.uk for tickets !! !